If there is a cycle lane use it. If there is a lane that vehicles use for travelling straight through, look behind and when it’s safe, signal intentions and move into the lane for traffic travelling straight ahead. If there is a continuous stream of fast flowing traffic that makes this unsafe, it will be safest to ride just to the left of this lane. Obey all signs, signals or markings and use the give way rules. Cycle in a straight line, maintain your speed, but be ready to stop if you need to. When you are through the intersection, check behind and return to the left. Keep left throughout the manoeuvre. On some left turns, you may want to ‘take the lane’ by moving into the centre of the lane, as you would if you were a car, to avoid being cut off by a vehicle on the corner. Be sure to check behind and signal your intentions. Slow down at the intersection and look right and ahead. If necessary, stop. Obey all signs, signals and markings and use the give way rules. If there is nothing coming, turn when clear, keeping to the left. Start looking behind well before the intersection to find a gap. Signal right for at least three seconds before you move to the right. Return your right hand to the handlebar. Do a quick check behind. When there is space for you to do it safely, signal your intentions and move towards the centre line or into the right turning lane. Slow down at the intersection. Look right, left, right and ahead. If necessary, stop. If there is nothing coming, turn when clear. Do not cut the corner. Move to the left after turning. A hook turn is a different way for cyclists to turn right at an intersection. This means that you can stay on the left side of the road at all times and mean that you don’t need to move across traffic to turn right. Hook turns can be done at any intersection, except at intersections that have signs banning hook turns. At some intersections there may be special marked areas to stop in at the half way turning point. It should be noted that hook turns can be done at intersections with or without the marked stopping area. This sign may be placed ahead of an intersection where a hook turn is recommended. Keep in the cycle lane, the left lane or the left most lane that goes straight ahead. Cycle across the intersection when the way is clear or the traffic signal, for going straight ahead, turns green. traffic that will want to turn left from the second arm of the intersection. Wait until the way is clear, or the traffic signals on the other side of the road turn green and then cycle across the intersection keeping left. Turning right at some intersections can be difficult. It is okay to find a safe place to stop prior to the intersection, get off your cycle and walk across the intersection. If there are pedestrian crossings walk your cycle across them. The other alternative is to do a hook turn. At intersections where vehicles are not controlled by give way signs, stop signs, roundabouts or traffic signals to tell you who has to give way, road users need to use the 'give way rules'. When two vehicles are coming towards each other and both are turning right, no one should have to give way. This is because normally neither will cross the other's path, so both vehicles can turn safely. However, be careful if the other vehicle is a large truck or bus as they may need more room to make the turn. You are turning, so you must give way to vehicles not turning. If you are turning right, you must give way to vehicles coming towards you, including those that are turning left. What are the give way rules? Road users should obey all road signs and traffic signals. If you are turning, give way to vehicles not turning. Note: if you are leaving the path of a marked centre line, you are deemed to be turning and must give way to vehicles that are following the centre line. If you are turning right, give way to vehicles coming towards you that are turning left (applies where both vehicles are facing no signs or signals or where both vehicles are facing the same signs or signals). At a T-intersection, all traffic from a terminating road (bottom of the T) has to give way to all traffic on a continuing road (top of the T). In all other situations, give way to all vehicles coming from your right, eg at a crossroad controlled by traffic signals, when the signals have failed and all approaches have a flashing yellow light. At a T-intersection, all traffic on a terminating road (bottom of the T) must give way to all traffic on the continuing road (top of the T). This also applies if the bottom of the T is a driveway. If you are leaving the path of a marked centre line at an intersection, you must give way to vehicles following the centre line. This is because vehicles leaving the path of the centre line are legally turning (even though sometimes they might actually be going in a straight line) and the give way rules apply. If you are turning, give way to all vehicles not turning. At a stop sign you must come to a complete stop in a position where vehicles coming from all directions can be seen. Look for vehicles approaching from all directions and move ahead only when the way is clear. If another vehicle is also stopped at a stop sign, then use the give way rules. Don't forget, at a cross intersection, check straight ahead as well as right and left. At a give way sign, slow down and be ready to stop. Give way to all other vehicles except those that have stopped at a stop sign. If you and another vehicle are coming towards each other and you are both at give way signs, use the give way rules. You must not go until it is safe for you and all other traffic. The same give way laws apply to cyclists and motorists. But cyclists still need to take care, in case other people don't stop or slow down. Try to get an idea of what other people are going to do. Have a good look around and try to make eye contact with the road users that should be giving way to you, so you can check that they have seen you. A red signal means stop. A yellow signal means stop, unless you are so close to the intersection that you can't stop safely. A yellow signal indicates that the lights will soon turn red. you give way to pedestrians crossing the road. This includes riders of mobility devices and wheeled recreational devices. A flashing yellow signal means the traffic signals are not working. In this case you must apply the give way rules including giving way to traffic approaching from your right if you are both turning or both going straight through. A red arrow means you must stop if you are travelling in the direction the arrow is pointing. A yellow arrow means you must stop if you are travelling in the direction the arrow is pointing, unless you are so close to the intersection that you can't stop safely. A green arrow means you can go if you are travelling in the direction the arrow is pointing, provided it is safe. The following examples will help you to get to know what traffic signals and arrows mean. Red flashing lights can be found in various places including near railway crossings, fire stations and ambulance stations. When you see red flashing lights you must stop and stay stopped until they stop flashing. Yellow flashing lights are found at roadworks. You can continue cycling, but you must be careful. The key thing when approaching traffic signals is to check you are in the correct lane, and be ready to stop, give way or go. If there is a queue of traffic waiting at the intersection, you will need to decide whether you stay where you are in the queue or whether it is possible to get to the front of the queue safely. Drivers in queues will have their view restricted by other vehicles, so you will need to be very wary of passing motor vehicles as they may change lanes unexpectedly. Some intersections with traffic signals have places where you can stop your cycle ahead of the other traffic waiting at the intersection. Use these places because they will help make you more visible to other traffic. However, if there is no traffic waiting behind you at the traffic signals, you may not get a green signal. The following section gives more information about vehicle detectors at traffic signals. A driver approaching an intersection must not enter a cycle lane if the driver’s intended passage or exit is blocked by stationary traffic so that the driver will obstruct the cycle lane. If there is traffic around, try to time your arrival at the signals with a larger vehicle that will trigger the detectors for you, or wait for the arrival of a larger vehicle. If there is no traffic around, look for the tell tale signs of the detector's location (tar filled saw cuts near the stop lines) and stop your cycle directly over any one of the tar cuts running in the same direction as you are riding. If you have been waiting for a while, no larger vehicles have arrived and you can't see the vehicle detector, re-position your cycle so that you can press the pedestrian crossing button. You may be able to do this from the road, in which case you will be able to cross by cycling (you will need to give way to any pedestrians). Where you need to cross the road from the footpath, you will need to get off and walk. Note: When you know your cycling routes better, you will get to know where the vehicle detectors are and whether they work for you. Cycle lanes or roads that have a lot of cyclists may have a special detector at intersections with traffic signals or crossing points. This detector is designed to be sensitive enough to pick up the presence of cyclists. The location of the detector is marked on the road surface either with three or more diamonds in a line or an arrow and is positioned where cyclists would normally stop. You should stop your cycle directly over the markings when waiting for green signals at crossing points. Roundabouts are another type of controlled intersection. Roundabouts can be difficult for cyclists, especially when there is a lot of traffic. When cycling straight through a roundabout intersection get into the correct lane. If you need to change lanes before the roundabout you must indicate for at least three seconds – do a quick check and signal your intentions before making your move. When you are at the roundabout you need to give way to vehicles already on the roundabout or entering the roundabout from a road to your right. When clear, move into the roundabout. Ride around the roundabout in the middle of the lane, not around the inner or outer edge. When you pass the exit before the one you want to leave from, check behind you and if you can indicate safely, indicate left. When turning left at a roundabout, you may need to ‘take the lane’ – move to the centre of the lane as you would in a car to avoid being cut off by a vehicle on the corner. Be sure to check behind and signal your intentions. When approaching the roundabout indicate to show that you are turning left. When you are at the roundabout you should continue indicating left and give way to vehicles already on the roundabout or entering the roundabout from a road to your right. When clear move into the roundabout, and continue indicating left if you are able. Maintain a position to the left of the left hand lane. When turning right at a roundabout get into the correct lane. In most cases you will need to move into the right hand lane - before making your move you must indicate for at least three seconds. When you are at the roundabout you need to indicate that you are turning right and give way to vehicles already on the roundabout or entering the roundabout from a road to your right. When clear move into the roundabout. When you are on the roundabout, try to continue indicating right if you are able, or indicate occasionally while you ride around the roundabout - this will let drivers waiting to enter the roundabout know your intentions. Ride in the middle of the lane, not around the inner or outer edge. Be careful to get in the correct lane to start with. Be assertive, and if practical, signal intentions clearly. Multi-laned roundabouts are difficult, so in some situations it may be easier to take a route that will avoid the roundabout altogether. Cycling in a rural environment can involve sharing the road with very fast traffic, often where there is very little road shoulder. Cycle with no more than two abreast. Ride single file on corners, hills and roads with less than 200 metres visibility. Be aware of potential hazards – approaching vehicles, pedestrians, animals, potholes, intersections, one lane bridges and loose gravel can all be hazardous. Follow the road rules, use hand signals and keep to the left. If you are holding up a flow of traffic, pull over to let them pass. Wear an approved helmet and consider high visibility clothing. 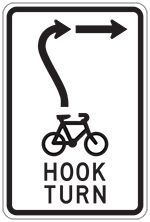 Check your equipment – use appropriate cycle lights and check your brakes, tyres, chain and reflectors before you ride.